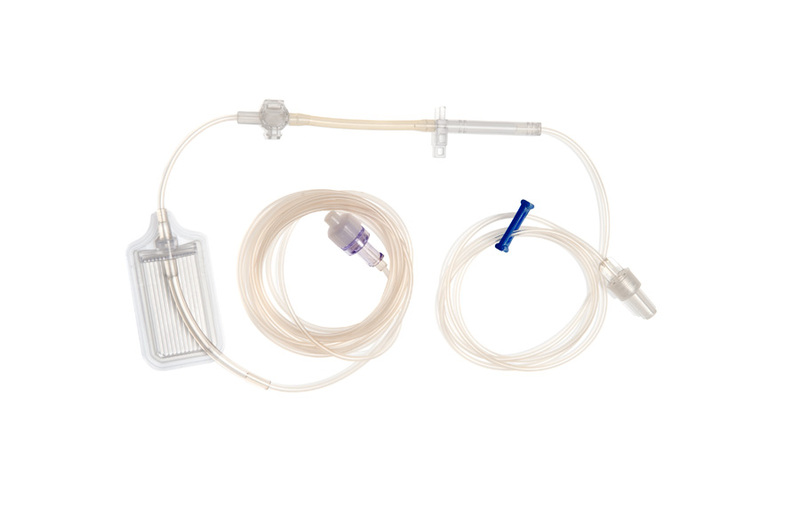 Our innovative Mini Rythmic™ PN+ Infusion Sets contain all necessary components such as air eliminator filter, non-return and anti-siphon valve and extension line. The design of the sets improves efficiency, while reducing hazards and false alarms. Air removal during filling and priming is easy and safe. The Mini Rythmic™ PN+ Infusion Sets are designed to be used with the appropriate Rythmic™ range pumps. Please click on the Specifications Tab on the right to see the available infusion sets and their specifications. Double vented spike connecting line of 20cm length, for multi- bags or multi-vials infusion , with back check valve on each connecting line, ends with female luer lock connector to connect either to Luer set PN F ref. KE1.EE.134.x or to a Male/Female manifold. DEHP Free tubing. Triple vented spike connecting line of 20cm length, for multi- bags or multi-vials infusion, with back check valve on each connecting line, ends with female luer lock connector to connect either to Luer set PN F ref. KE1.EE.134.x or to a Male/Female manifold. DEHP Free tubing.